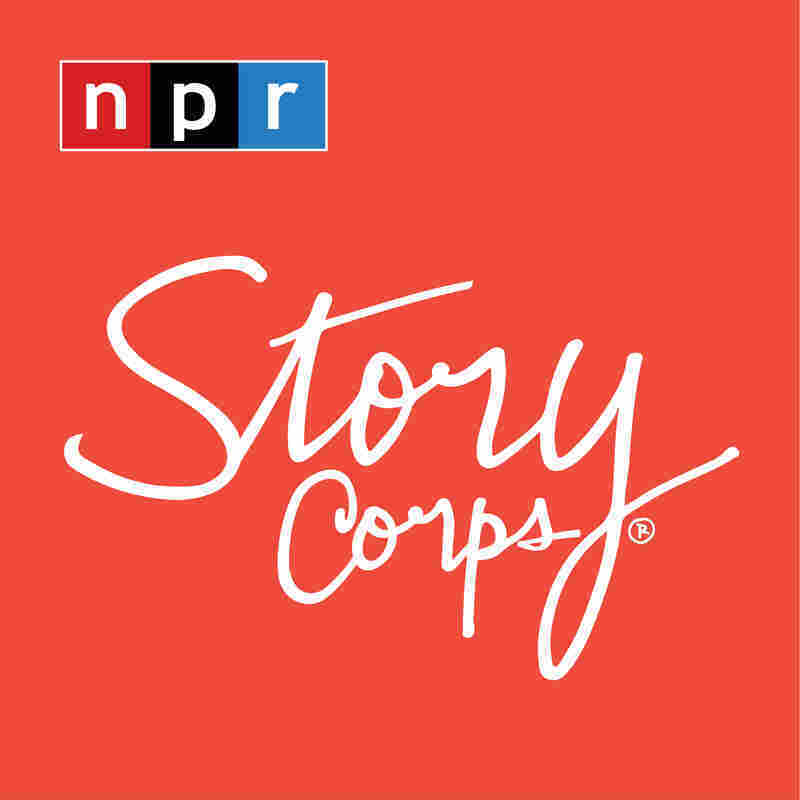 StoryCorps: Sisters Find Home In Utah After Somali Civil War Made Them Refugees Annie and Randall Johnson have two teenage daughters who came to the U.S. as refugees from the Somali civil war. Since meeting, they've learned about both cultures, all while becoming a family. 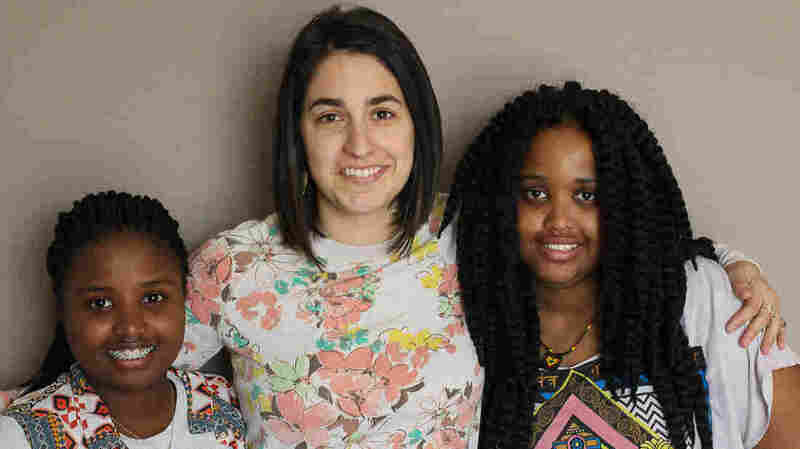 Annie Johnson and her daughters Fatuma Abdullahi, 14, and Maryan Osman, 15. Fatuma and Maryan were refugees from Somalia's civil war, but found a family and new life with the Johnsons. Fatuma Abdullahi and her sister Maryan Osman are originally from Somalia, but when they were little girls, their parents died during the civil war there and both girls became refugees. Since then, the girls, who are now teenagers, have found a stable home with Annie and Randall Johnson, a young couple from the Salt Lake City area. Last summer they welcomed their little brother, Roscoe, into the world. All in all, the five have become a family in their own way. "Not a lot of people become a mom at 28 to teenage daughters," Annie says. "So, the learning curve has been steep." Maryan laughs and agrees with Annie as she thinks back to when they all met for the first time. "You just walked up to me with all of the confidence in the world, stuck your hand out there and you're like, 'Hi, I'm Maryan,' " Annie says. Annie says Maryan sized her up a bit while asking if she was old enough to be a mom. "And I remember, Fatuma, when you were just so shy, and quiet. Which was OK, because we were so nervous." U.S. culture varies a lot from the girls' homeland culture, which meant they had to adjust to life with their American family. The girls say their surroundings are noticeably different from their home in Africa. "Here the neighbors, [are] so quiet, you feel like you're living by yourself," Maryan says. "Even in the jungle animals made sounds, but here the sounds you hear is only the cars." Language is also a big part of culture, but both the parents and daughters have worked to learn about each other's. "The funniest thing is teaching you guys weird American sayings," Annie says. "Like, 'beating a dead horse.' "
Maryan responds by asking why anyone would beat a dead horse, and adding, "It's already dead!" She also says she finds it funny when Annie is learning Somali, and it reminds her of when she was learning English and "would speak in funny ways." "I can say 'I love you,' which is ... Waan ku jeclahay," Annie says. But saying "I love you" in any language isn't the only way the family shows that they care about each other. Last year around the time of Maryan's birthday, she says she became overwhelmed about her past and had panic attacks at school. Annie says she was scared for Maryan, "because you were really struggling at that time," but Maryan remembers how her mother responded. "You told me that, 'I am always there to talk to you,' and you hugged me a lot," Maryan says. Maryan says that was awesome, but there are other things she loves about her family. "The best thing I love about you guys is no matter what I do, you still forgive me and give me chance to move on," she says. Annie admits that being a mom is hard work and she has doubted herself a lot, but learned a lot as well. "You don't know if you're doing things right. I've learned a lot about patience. And I've learned a lot about love. You guys have just given so much joy and meaning to my life. I love you so much. So happy that you are my daughters." Audio produced for Morning Edition by Von Diaz.